​Among the Bangor Land Trust preserves the one that fascinates me the most is Northeast Penjajawoc Preserve. It is there that I have the opportunity to observe up close the northeast tip of Penjajawoc Marsh. It is a magnificent area for birds (resident, migratory, nesting, rare, and endangered), but it’s the wetlands themselves that speak to me. What makes it a marsh? What about it makes it such a rich biodiverse area? Following the trail from the Kittredge Road, you descend to the marsh. If you cross the bridge and bear right, you go uphill. Thus the area is like a bowl, with the marsh at the bottom of the bowl. The marsh acts like a sponge, absorbing great quantities of water during storms and releasing the water slowly at other times. Some water ever so slowly seeps down into the groundwater, gradually raising the water table. When bubbling, gurgling streams enter the basin, they suddenly slow down. The debris, sediment, nutrients, and minerals they’ve carried along start to settle out, like soggy Cheerios sinking to the bottom of your cereal bowl. It’s here that the biodiversity begins. To quote Alice Outwater (1996) in Water: A Natural History, “The wetlands’ underwater world does a remarkable job of cleaning the water” (pg. 25). The microscopic plankton bacteria chow down on the organic matter, while the tiny phytoplankton make food for themselves from the inorganic matter. And thus the water is cleaned. But it doesn’t stop with housekeeping. Because the water has slowed, it becomes warmer. The plankton, at the bottom of the food chain, increase in numbers in warmer water. With more plankton there can be more zooplankton. With more zooplankton there can be more insects. With more insects there are more frogs, salamanders, minnows, and, yes, birds. You get the picture. The whole ecosystem (and food chain) benefits from the wetlands being a slow water, spongy place. This space we call a cattail marsh is made up of about 50% open water and 50% cattails, sedges, arrowhead, pickerelweed, and other plants. 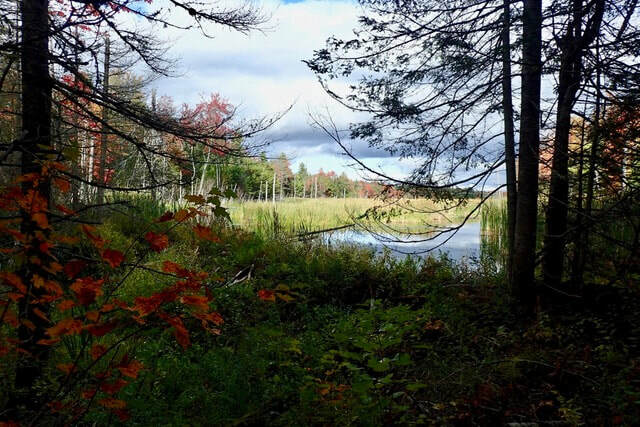 These plants provide food for muskrats and beavers, as well as food for ducks and other birds. These plants also offer protective nesting areas for Least Bitterns, wrens, and American Coots. All of this is undergirded by bedrock, glacial marine silt and till, and topped off with muck...glorious muck. No, muck is not just a brand of boots, it’s also an important soil type. The black, granular, water-saturated, muddy stuff is rich in organic matter coming from decomposed plants, plankton, and other micro-creatures. Muck is an important component of what makes a marsh a marsh. Marshes are incredible, complex places that include grasslands that are a transition zone between the aquatic and terrestrial spaces. These, too, are valuable to wildlife. Collectively, the marsh complex supports great biological diversity. Thus we come full circle. Next time you are at Northeast Penjajawoc Preserve check out the marsh. It’s a remarkable composite of life. View from Station #2 (Cattail Marsh) in Northeast Penjajawoc Preserve. Photo taken by Grace Bartlett.